Let the baking begin! 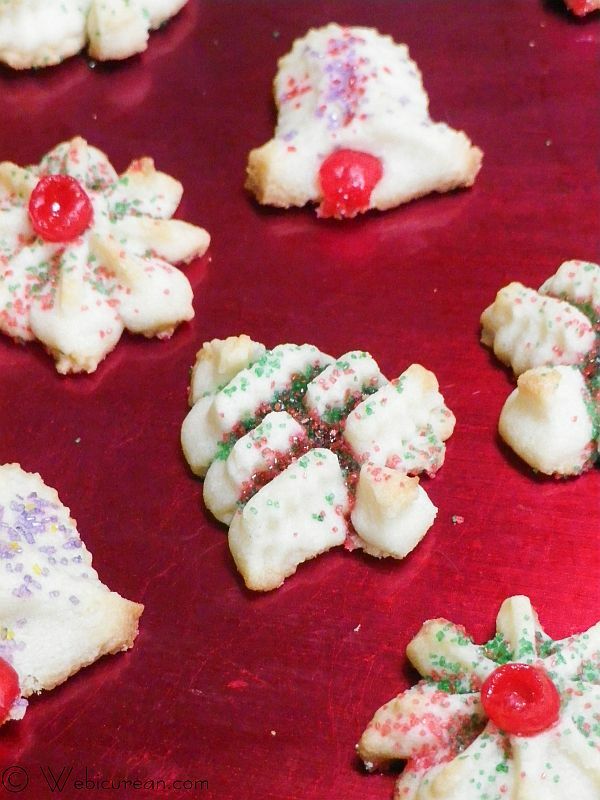 What better way to get into the spirit of the holiday season than to whip up some Christmas cookies? I know, it’s early, but if you get a jump on the baking frenzy now, you can stash them in the freezer so they’re ready for gift giving at a moment’s notice. Or you could simply nosh on them as you go–it’s really up to you. Hopefully my cookie series, #TwelveDaysofSanta, will inspire you in the kitchen this holiday season–that is, twelve days of Santa lore together with a cookie recipe representing that country. A Christmas Around the World of sorts, spread out over the next few weeks, and we’re kicking it off with Germany and Spritz Cookies. Christmas in Germany is considered to be the most important holiday, and celebrations commence with the first Sunday of Advent and stretch through the New Year. Christkindlmarkt or Christmas Markets are the highlight of the season. They’ve been around since the 14th century and pop up in every town, large or small, with vendors peddling baked goods, tree decorations, and other seasonal, hand-crafted items. This is the best place to find all things Christmas. Saint Nicholas Day is celebrated on December 6, and on the evening of the 5th, it is custom for children to leave their shoes or boots on the front doorstep in the hope that St. Nicholas might fill them with nuts, fruits, sweets, and other gifts. Of course, rather than treats, misbehaving children can expect a teasing from Knecht Ruprecht or Krampus. During the Middle Ages, Martin Luther, in wanting to sever the connection between the saint and gift-giving, adopted the Christ Child (“Christkind“) as the figure who brought gifts and on Christmas, rather than on the Saint’s holiday. Christkind is depicted as an angelic female with golden tresses, in white robes and a golden crown. Children leave letters on their windowsill decorated with glue and sugar to make them sparkle in anticipation of Christkind‘s arrival. While many still recognize Christkind as the holiday’s gift-bringer, a more secular figure, der Weihnachtsmann (“Christmas Man”) has mostly taken its place. Much like Santa Claus, der Weihnactsmann is depicted as a jolly old man with a flowing white beard, donning a red suit, and carrying a sack full of gifts. Rather than squeezing down a narrow chimney, though, he quickly slips in and out the door, leaving presents behind for well-behaved children. During the holiday season, much baking occurs, most notably Stollen and Lebkuchen. Then there are the Spritz cookies. Often we associate Spritz cookies with Sweden, probably because they’re also known as Swedish Butter Cookies. Spritz cookies, however, originated in Germany in the 1500s, and the name is derived from the German verb spritzen, meaning to squirt. As the name suggests, the dough is “squirted” through a cookie press, which is really nothing more than a culinary caulking gun. I stuck with three simple shapes, but your cookie press probably came with about a dozen different disks, so try them all. 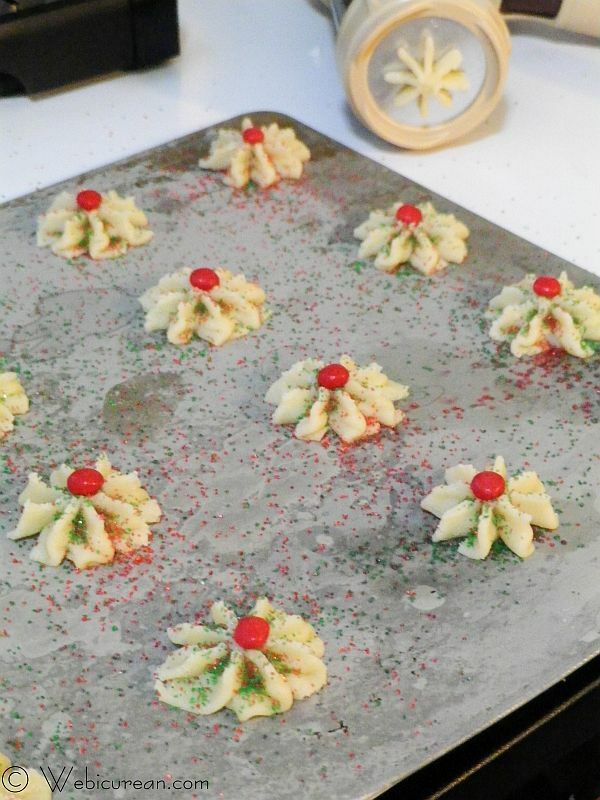 To make wreaths, use the star tip to pipe out enough dough to form a small circle. Unfortunately, I lost my star tip, so I made do with what I had. The best part about these cookies is that they’re unbelievably simple to make once you get the hang of the cookie press . 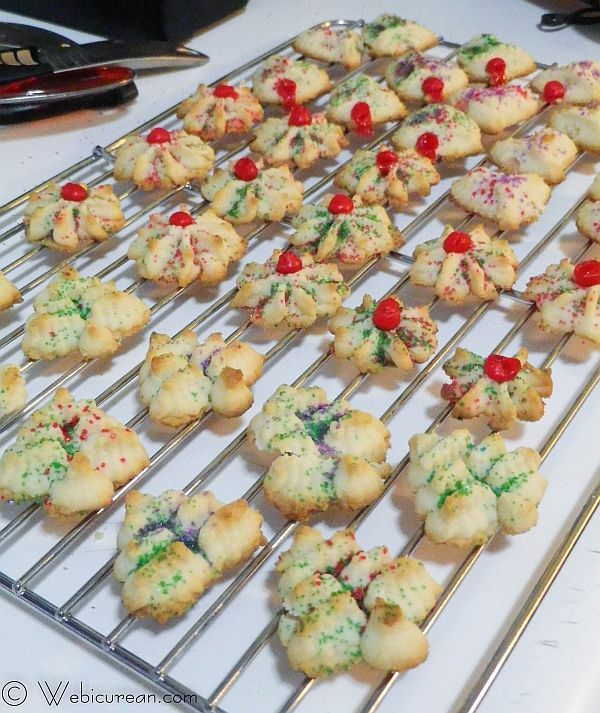 These Spritz cookies are crisp and buttery, and make a pretty addition to any Christmas cookie platter. This recipe was adapted from McCall’s Cooking School . First, you’ll want to sift the flour with the salt and set that aside. 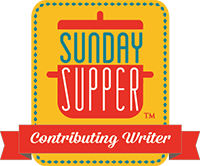 By the way, Joy the Baker has the most awesome tip about sifting–that is, you don’t need to sift at all but instead whisk your flour right in the container to aerate it. 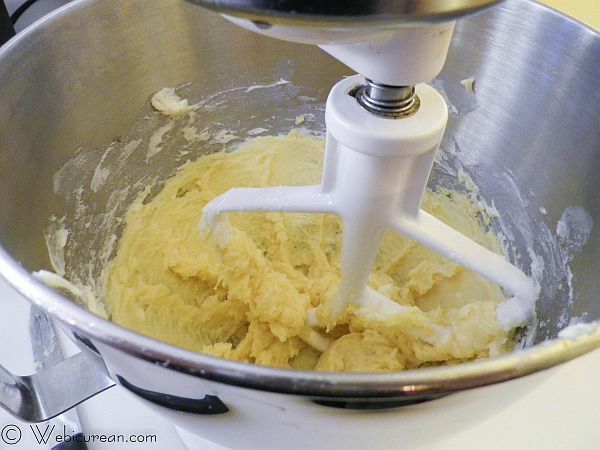 Then in the bowl of your mixer, cream together the butter, sugar, egg yolk, and vanilla. Beat this until smooth and fluffy. Next, stir in the flour mixture about a third at a time until completely blended. 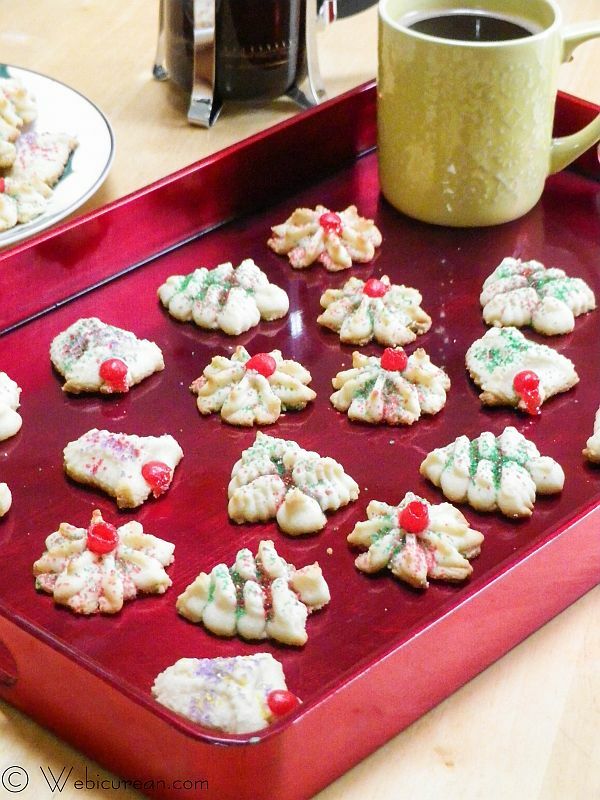 Stuff the dough into the cookie press, and start pumping out the cookies onto an ungreased, well-chilled cookie sheet.Â Decorate with cinnamon candies, colored sugars, or whatever else strikes your fancy. Bake about 8-10 minutes, or until they start to turn golden.Â Immediately transfer to a wire rack to cool. Arrange them on a cutesy Christmas plate. 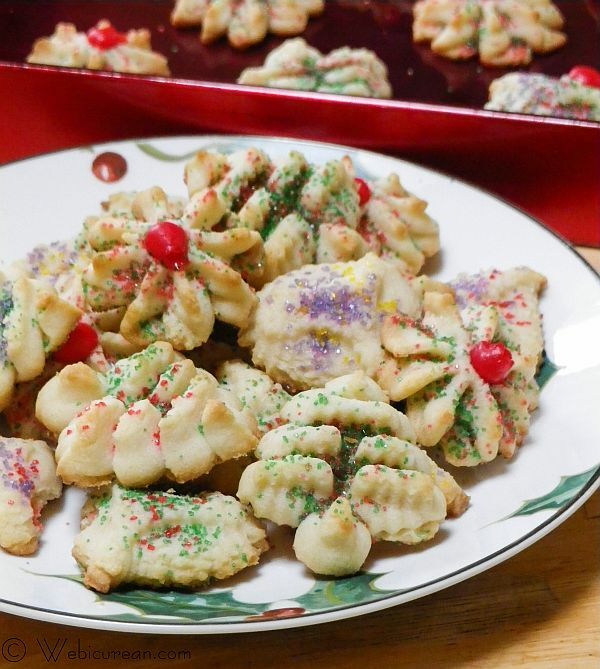 Crisp and buttery, these Spritz cookies are a festive holiday tradition in Germany and Sweden. Before you begin, refrigerate several ungreased cookie sheets. 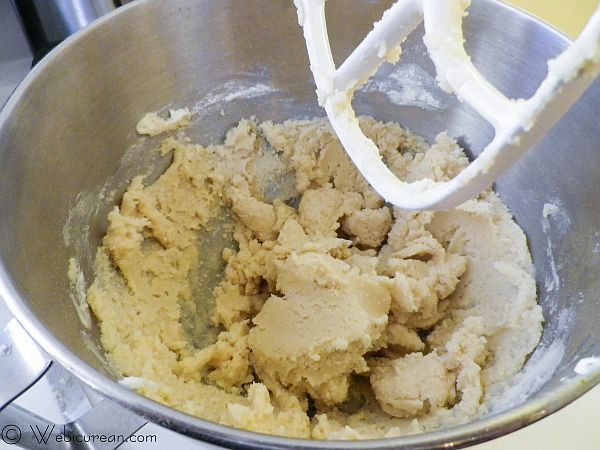 In a large mixer bowl, beat the butter, sugar, egg yolk, and vanilla until smooth and fluffy. With the mixer on low, beat in the flour mixture one third at a time, mixing until smooth and well combined. Assemble and fill the cookie press according to the manufacturer's instructions. Stand press upright on the cold cookie sheet. Squeeze out enough dough to form the shape on the disk, and release pressure, lifting up slightly to cut off the dough. Cookies should be about 1½ inches apart. Decorate with the cinnamon candies and colored sugar. Bake 8 to 10 minutes, or until light golden. Remove to a wire rack and cool. Also note: Make sure the cookie sheets are well chilled before making the cookies or the dough might melt! I have not made spritz cookies in years! I think it’s time to dust off my press and make a batch for the holidays. Your recipe sounds perfect! Thanks! I love that they’re so easy to make! My cinnamon candies always melt, how do I prevent this from happening? I honestly don’t know! My oven has been running super hot lately, so the cookies baked in less time than normal–my guess is that those cinnamon candies just didn’t have time to melt (the cookies were in the oven for about 6 mins). Some of them started to melt, as you can see, but not completely. This is amazing! I love the idea. It’s beautifully done.